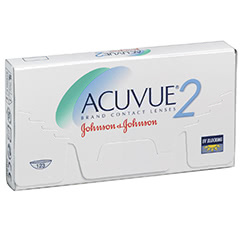 Acuvue 2 contact lenses provide optimum comfort for wearers because they allow high levels of oxygen to your eyes. This helps to keep them moist throughout the day to avoid irritation. Developed by manufacturer Johnson & Johnson, these lenses are easy to insert and remove. This is thanks to a blue surface tint, which makes them easy to spot on your finger. The built-in UV protection also helps to protect your eyes from the sun's harmful rays. For speedy delivery and high quality products, order your Acuvue 2 lenses from Lenstore.co.uk today. We don't like to keep our customers waiting, so we offer the option of next day UK delivery straight to your door. You will also receive other exclusive offers, such as a free eye test at your local Vision Express.